Plate from Bates illustrating Batesian mimicry between Dismorphia species (top row, third row) and various Ithomiini (Nymphalidae) (second row, bottom row). Batesian mimicry is a form of protective mimicry whereby one species, which is otherwise unprotected or harmless with respect to a particular predator, closely imitates in some way aspects of another species that is considered harmful or unpalatable to this common predator, and thus the mimic is avoided by the predator. For example, the mimic may adopt similar warning coloration as exhibited by the harmful or unpalatable model species, or may produce a similar sound as the model species. The nonvenomous scarlet kingsnake, scarlet snake, and milk snake have similar color banding as the venomous coral snakes in their range, and some harmless moths make similar ultrasonic sounds as moths that are unpalatable to bats. The burrowing owl makes hissing vocalizations similar to the sound that a rattlesnake makes, which would appear to dissuade predators from entering its underground nests. Batesian mimicry involves three different species, where the mimic, model, and signal receiver (predator) are of different species. The majority of Batesian mimics are insects. Batesian mimicry is one of many interrelationships in ecosystems whereby one species mimics another. A similar form is Müllerian mimicry, where both prey species have their own true protection from a predator. In Müllerian mimicry, all three species can benefit, as each mimic reinforces the danger to the predator. In Batesian mimicry, the mimic benefits but not the model. The various forms of mimicry add to the diversity and wonder of nature. Batesian mimicry is the most commonly known and widely studied of mimicry complexes, such that the word mimicry is often treated as synonymous with Batesian mimicry. It is named after the English naturalist Henry Walter Bates, after his work in the rain forests of Brazil. Mimicry is a phenomenon among organisms in which one organism shares common characteristics (for example, morphology) with another organism so as to create a confusion in the predator. The organism imitating the protected species is referred to as the mimic, while the imitated organism is known as the model. In the mimicry, the mimic gets benefits like protection from predators, easy capture of its prey, and so forth. Though mimicry is most obvious to humans in visual mimics, other senses such as olfaction (smell) or hearing may be involved, and more than one type of signal may be employed (Wickler 1968). Mimicry may involve morphology, behavior, and other properties. In any case, the signal always functions to deceive the "signal receiver" (or "dupe") by preventing it from correctly identifying the mimic. While model and mimic are often from related taxa, mimicry of very distant relatives is also known. In Batesian mimicry, the model has protective mechanism against a predator, such as warning coloration announcing to the predator that it is harmful or unpalatable. The mimic, which is palatable and harmless to the predator, copies this aspect of the model, such as adopting similar warning coloration, and thus the signal receiver is confused into thinking the mimic is the model and thus should be avoided. Batesian mimicry need not involve visual mimicry, but can employ deception of any of the senses. For example, some moths mimic the ultrasound warning signals sent by unpalatable moths to bat predators, a case of auditory Batesian mimicry. A cocktail of deceptive signals may also be used. By parasitizing the honest warning signal of the protected species, the Batesian mimic gains the same advantage, without having the energy invested in arming themselves. The model, on the other hand, is disadvantaged, along with the dupe. If imposters appear in high numbers, positive experiences with the mimic may result in the model being treated as harmless. Additionally, in higher frequency there is a stronger selective advantage for the predator to distinguish mimic from model. For this reason, mimics are usually less numerous than models. However, some mimetic populations have evolved multiple forms (polymorphism), enabling them to mimic several different models. This affords them greater protection, a concept in evolutionary biology known as frequency dependent selection. There are many other forms of mimicry, however—some very similar in principle, others far separated. Of note, Batesian mimicry is often contrasted with Müllerian mimicry, a form of mutually beneficial convergence between two or more harmful species. However, because the mimic may have a degree of protection itself, the distinction is not absolute. Batesian mimicry also can be contrasted with functionally different forms of mimicry. Perhaps the sharpest contrast here is with aggressive mimicry, where a predator or parasite mimics a harmless species, avoiding detection and improving its foraging success. The distinction between Batesian mimicry and crypsis (the ability of an organism to avoid observation, such as through camouflage) is clear: The mimic is noticed, but treated as something it is not. On the other hand, camouflaged prey would often create the same effect by being invisible. Henry Walter Bates (1825–1892) was an English explorer-naturalist who surveyed the Amazon Rainforest with Alfred Russel Wallace in 1848. While Wallace returned in 1852, Bates remained for over a decade. His field research included collecting almost a hundred species of butterflies from the families Ithomiinae and Heliconiinae, as well as thousands of other insects specimens. In sorting these butterflies into similar groups based on appearance, inconsistencies began to arise. Some appeared superficially similar to others, even so much so that Bates could not tell some species apart based only on wing appearance. However, closer examination of less obvious morphological characters seemed to show that they were not even closely related. Shortly after his return to England, Bates presented a paper on his theory of mimicry at a meeting of the Linnean Society of London on November 21, 1861, which was then published in 1862, as "Contributions to an Insect Fauna of the Amazon Valley" in the Transactions of the Linnaean Society (Bates 1862). He elaborated on his experiences further in The Naturalist on the River Amazons (Bates 1863). These new findings and speculations stimulated long lasting discussion and controversy, not limited to the scientific realm. This naturalistic explanation fitted well with the recent account of evolution by Alfred Russel Wallace and Charles Darwin, as outlined in Darwin's famous 1859 book, The Origin of Species. The term mimicry had only been used for people until about 1850, when the word took on a new life in its application to other life forms such as plants and animals. Just as Darwin was the first to put forward a comprehensive explanation for evolution, Bates was the first to elucidate this form of mimicry, and he is thus honored with the term Batesian mimicry. Although other forms have been discovered even in recent times, Batesian mimicry is one of the most commonly occurring and well understood. To many, the word Batesian mimicry and mimicry are treated as the same thing, however, it should not be overlooked that Bates described several kinds of mimicry himself (Pasteur 1982). 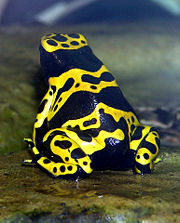 The yellow-banded poison dart frog Dendrobates leucomelas illustrates aposematic coloration. Most living things have at least one predator for which they have protective adaptations. Some organisms have mechanisms to make detection less likely; this is known as camouflage. Other organisms are not profitable for potential predators even if they do locate them. Some lizards, for example, will do "pushups" if they are spotted, advertising to the predator just how strong and healthy they are—that pursuing them is just not energetically profitable. Still others, however, are harmful even if the predator can eat them, for example, many plants and fungi contain deadly toxins and other chemicals, while certain snakes, wasps, and other animals are able to poison, injure, or otherwise harm many of the predators who would otherwise eat them. Such prey often send clear warning signals to their attackers, such as strong odors, bright colors, and warning sounds. Use of such messages is known as aposematism. Aposematism, perhaps most commonly known in the context of warning coloration, describes a family of antipredator adaptations where a warning signal is associated with the unprofitability of a prey item to potential predators. Aposematic prey need not display such signals all the time. It may be energetically costly for them to do so, and even if it is not, they may have other predators that can tolerate their defenses. In fact, even if all their predators will avoid them if adequately warned, there are still those predators that have not yet learned that they are dangerous. Short of instinctive programming to avoid the aposematic organism (which is seen occasionally), a prey would have to be sacrificed in order to educate a predator, which is disadvantageous for the organisms doing the educating. Thus, a combination of camouflage and its antithesis, aposematism, often occur. However, once a predator has learned from harsh experience not to go after such prey, it will be likely to avoid anything that looks even remotely similar if it can. It is in this fashion that Batesian mimics work. For the point of view of natural selection, it is the duped predator that does the selecting, choosing to avoid those prey that look most like the aposematic model. In this way, it is held that the signal receiver directs the evolution of the mimic toward closer and closer similarity to the model. Batesian mimicry is a case of protective or defensive mimicry, where the mimic does best by avoiding confrontations with the signal receiver. It is a disjunct system, which means that all three parties (mimic, model, and signal receiver) are from a different species (Vane-Wright 1976). Batesian mimicry stands in contrast to other forms of mimicry, such as aggressive mimicry, where the mimic profits from interactions with the signal receiver. One such case of aggressive mimicry is in fireflies, where females of one species mimic the mating signals of another species, deceiving males to come close enough for them to eat. Mimicry need not involve a predator at all though. Such is the case in dispersal mimicry, where the mimic once again benefits from the encounter. For instance, some fungi have their spores dispersed by insects by smelling like carrion. In protective mimicry, the meeting between mimic and dupe is not such a fortuitous occasion for the mimic, and the signals it mimics tend to lower the probability of such an encounter. One case somewhat similar to Batesian mimicry is that of mimetic weeds, which imitate agricultural crops. In weeds, or Vavilovian mimicry, the weed does not profit from encounters with a person or his winnowing machinery; at best the weed is left, at worst it is destroyed. Vavilovian mimicry is not a case of Batesian mimicry, however, because the person and crop are not enemies. Indeed, the crops derive their protection from insects, weeds, and competition with other plants from their growers. Another analogous case within a single species has been termed Browerian mimicry (Pasteur 1982), after Lincoln P. Brower and Jane Van Zandt Brower (Brower 1970; Brower et al. 1967). This is a case of bipolar (only two species involved) automimicry (Vane-Wright 1976); the model is the same species as its mimic. Equivalent to Batesian mimicry, but within a single species, it occurs when there is a "palatability spectrum" within a population of harmful prey. For example, monarch butterflies (Danaus plexippus) feed on milkweed species of varying toxicity. Some larvae will feed on more toxic plants, and store these toxins within themselves, while others will not. The less palatable caterpillars will thus profit from those that ingest high levels of toxic substances, just as other butterfly species benefit from mimicry of monarchs. The Heliconius butterflies from the tropics of the Western Hemisphere are the classical model for Müllerian mimicry (Meyer 2006). Batesian mimicry belongs to a subclass of protective mimicry that can be called aposematic mimicry—the mimicry of an aposematic, protected species. Another important form of protective mimicry is Müllerian mimicry, named after the naturalist Fritz Müller. 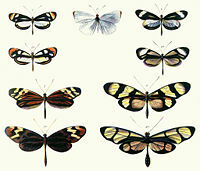 Müllerian mimicry is similar to Batesian mimicry in some respects, but quite opposite in others. In Müllerian mimicry, the model is an aposematic prey as well, but the mimic itself is also aposematic, with its own true protection. Such cases troubled Bates, for which he could offer no explanation. If the mimic was protected already, what did it have to gain by copying another organism? Müller came up with an explanation for this puzzle in 1878. Unlike in Batesian mimicry, the model is not being pirated by the mimic. In fact, the key here is that the model actually benefits from being mimicked, because it can share the troublesome burden of enlightening the predator of its harmful properties. In this cooperative enterprise, both parties benefit. It could thus be classified as a form of mutualism, an ecological relationship where two species gain mutual advantage from a biological interaction; in this case via the signal receiver. In this account, it has been assumed that one species acts as a mimic and the other as a model. But which species should be designated each part? If two aposematic species that encounter the predator in equal number equally often come to mimic each other, it becomes completely arbitrary to call one a mimic and another a model. In fact, both can be said to be comimics, as the role of mimic and model is shared by both. Each species gains from the negative experiences of their common predator with the other. Another problem is that the predator is not actually deceived regarding the harmful properties of the "mimic," as both species are truly harmful. For these two reasons, some have suggested Müllerian mimicry is not mimicry at all, and have proposed terms such as Müllerian resemblance or Müllerian convergence. Looked at in another light, however, it can still be seen as a form of deception in that the signal receiver treats the species with which it has not had an unpleasant experience as if it were the model. This is a case of mistaken identity, although one that benefits the predator. Whether treated as mimicry or not, Müllerian convergences certainly breaks many of the assumptions that normally apply to mimicry complexes, and are quite the opposite of Batesian mimicry. Though visual mimicry has been extensively researched, acoustic mimicry is also known, and occurs in a variety of species. Predators may identify their prey by sound as well as sight, and mimics have evolved that play tricks on the hearing of those that would eat them. 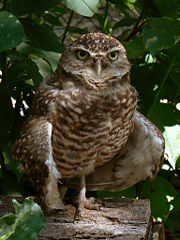 The burrowing owl employs auditory mimicry. One such case is the burrowing owl (Athene cunicularia), which nests in the ground. This species gives a hissing call that sounds much like a rattlesnake, which often spend the day underground. Both the parent and young make such hissing vocalizations when threatened. One predator of nestlings is the Douglas ground squirrel, which is duped by this auditory imitation. Rattlesnakes are a predator of sciurids, and use their burrows for thermoregulation. (Experiments have shown that squirrels that are sympatric (live in the same area) with such owls are more cautious than other populations (Rowe et al. 1986)). Another case is not one people would notice by chance, as it occurs in the ultrasonic range. Bats rely heavily on echolocation to detect their prey, such that their auditory system might well be equivalent both in importance and perceptual nature to the human visual system (Dawkins 1986). Some potential prey are unpalatable to bats, however, and produce an ultrasonic aposematic signal, the auditory equivalent of warning coloration. In response to echolocating red and big brown bats, tiger moths produce warning sounds. Bats learn to avoid the harmful moths, but due to their association of the warning signal with danger, they similarly avoid other species that produce such warning sounds as well. Results like these indicate acoustic mimicry complexes, both Batesian and Mullerian, may be widespread in the auditory world (Barber and Conner 2007). Barber, J. R., and W. E. Conner. 2007. Acoustic mimicry in a predator–prey interaction. Proceedings of the National Academy of Sciences 104(22): 9331-9334. Retrieved September 18, 2008. Bates, H. W. 1862. Contributions to an insect fauna of the Amazon valley. Lepidoptera: Heliconidæ. Transactions of the Linnean Society of London 23: 495-566. Bates H. W. 1863. The Naturalist on the River Amazons. London: Murray. Retrieved September 18, 2008. Brower, L. P. 1970. Plant poisons in a terrestrial food chain and implications for mimicry theory. In K. L. Chambers (ed. ), Biochemical Coevolution Corvallis, OR: Oregon State Univ. Brower, L. P., J. V. Z. Brower, and J. M. Corvino. 1967. Plant poisons in a terrestrial food chain. Proceedings of the National Academy of Sciences USA 57: 893-98. Cott, H. B. 1940. Adaptive Coloration in Animals. London: Methuen and Co. ISBN 0416300502. Dawkins, R. 1986. The Blind Watchmaker. New York: W. W. Norton & Company. ISBN 0393315703. Edmunds, M. 1974. Defence in Animals: A Survey of Anti-Predator Defences. Harlow, Essex: Longman. ISBN 0582441323. Evans, M. A. 1965. Mimicry and the Darwinian Heritage. Journal of the History of Ideas 26 (2): 211-220. Meyer, A. 2006. Repeating patterns of mimicry. PLoS Biol 4(10): e341. Pasteur, G. 1982. A classificatory review of mimicry systems. Annual Review of Ecology and Systematics 13: 169–199. Rowe, M. P., R. G. Coss, and D. H. Owings. 1986. Rattlesnake rattles and burrowing owl hisses: A case of acoustic Batesian mimicry. Ethology 72: 53:71. Vane-Wright, R. I. 1976. A unified classification of mimetic resemblances. Biological Journal of the Linnean Society 8: 25-56. Wickler, W. 1968. Mimicry in Plants and Animals (Translated from the German). New York: McGraw-Hill. ISBN 0070701008. This page was last modified on 22 September 2008, at 17:31.